The Marvelous Mrs. Maisel Creator Might Make Gypsy NowWhat will Barbra say?? Why Are Timothée Chalamet and Barbra Streisand Hanging Out Without Me?What do you think they talked about? What Did Critics Think of the Other Versions of A Star Is Born?A look back at all the various stars that have been born, including Judy Garland, Janet Gaynor, and Barbra Streisand. Barbra Streisand Is Trapped in a Well, Releasing New MusicStreisand released her song “Don’t Lie to Me” from her album Walls. Never-Before-Seen Photos of Barbra StreisandA new book of photographs by Bill Eppridge feature her earliest career moments. Of Course Barbra Streisand Cloned Her DogMiss Scarlett and Miss Violet are clones of her beloved dog Samantha, who died in 2017. Ben Platt, Streisand, and Gwyneth Paltrow Might Star in Ryan Murphy Netflix ShowThe Politician will, of course, be a musical. 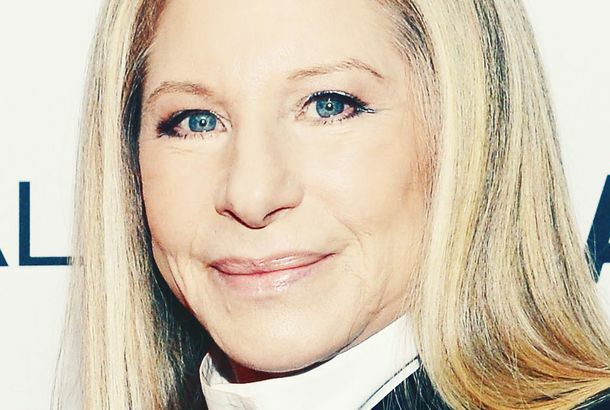 The Enduring Legacy of Barbra StreisandShe can invoke nostalgia powerfully for her loyal fans in concert, but has been less able to convert the uninitiated. 21 of the Most Barbra Streisand Moments in Her Netflix Concert FilmFrom eating crabs to celebrating her dog. Barbra Streisand Made a Fittingly Over-the-Top Concert Film for NetflixBarbra: The Music…The Mem’ries…The Magic! premieres November 22. Barbra Streisand Gave Hillary Clinton Her Nth Standing Ovation in BrooklynThe former secretary of State and husband Bill were in the audience at Barclays Center. Even Female Film Critics Were Crappy to Barbra Streisand When She Was a DirectorHollywood, can you hear me? Barbra Streisand Is Stritching on the Cover of W MagazineAnother pantsless legend. Revealed: The World Trade Center’s Arts ComplexMarble under glass. Of Course Barbra Streisand’s New Album Is No. 1A No. 1 album is born again, baby. Barbra Streisand and Alec Baldwin Sing a DuetIt’s the latest teaser for Streisand’s new album. Barbra Streisand and Jamie Foxx Sing ‘Climb Ev’ry Mountain,’ Break Ev’ry HeartLet Barbra and Jamie climb your heartstrings. Barbra Streisand Returns to the TonysShows up when she’s good and ready — boss. Streisand Announces Celebrity Duets AlbumEncore: Movie Partners Sing Broadway features Hollywood stars singing Broadway classics. Barbra Streisand Gets Best Birthday Present EverSimply beautiful. Streisand Might Bring Mama Rose to Big ScreenBabs would take the lead role — if this ever gets made. Keira Knightley Is in Talks to Be Barbra Streisand’s Catherine the GreatKeira gets back to those corsets. Arnold Scaasi Put an American Stamp on CoutureThe socialite and First Lady–beloved designer has died at 85. Rare Photos From Barbra Streisand’s Glory DaysA timeline of her long, varied career. Ask Polly: How Do I Get Over the Co-worker I Slept With?Stop looking for intrigue and settling for moody-dude leftovers. Barbra Streisand Considering Lady Gaga for GypsyEverything’s coming up Gaga. Barclays Center Accused of Racial Profiling Jay-Z fans had to go through them, Streisand fans did not. Barbra Streisand Is From BrooklynBabs’s Barclays Center homecoming was as emotional, eccentric, and over-the-top as only she can be.